When I first posted this recipe I highlighted the age old issue of buying food that you just don’t get round to eating. I also bet every single one of you can look in the fridge on a weekly basis and find that ONE thing you seem to buy no matter what. No matter how dedicated you are to meal planning, and using up everything so that you don’t create waste, there’s always something lurking in the back of the fridge that just sits there. It’ll be something that you just don’t really know what to do with, but that you love nonetheless. We also tend to buy a lot of asparagus. And, it is a pretty expensive vegetable to be buying when you have no plans to use it. I’ve tried a whole range of recipes. From griddled asparagus with almond butter (yet to make it’s way to the blog) to simply steamed alongside salmon. But the more times you have it steamed, or with butter, it starts to get boring. Luckily for me it seems sausages and asparagus work quite well together! At university I used to love coming up with sausage dishes mainly alongside pasta as always had some in the cupboard. Sausages are so versatile they can be put with the spiciest of tomato sauces and the creamiest of white sauces . Before I came up with this recipe, at home (meaning my parent’s house), our sausage experiences are a little more conservative…usually toad in the hole, or sausages and mash! Not that I’m complaining! They are two of the best comfort foods. 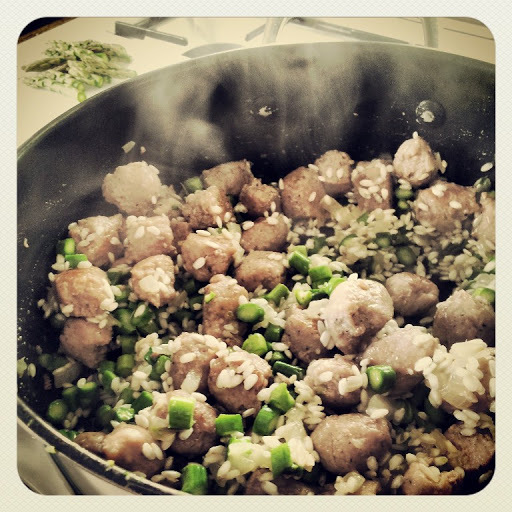 Now, this recipe makes it’s way on to our dinner table every couple of weeks! And I’ve managed to stop the ‘rents buying sausages if we don’t have any need for them. It’s a miracle! 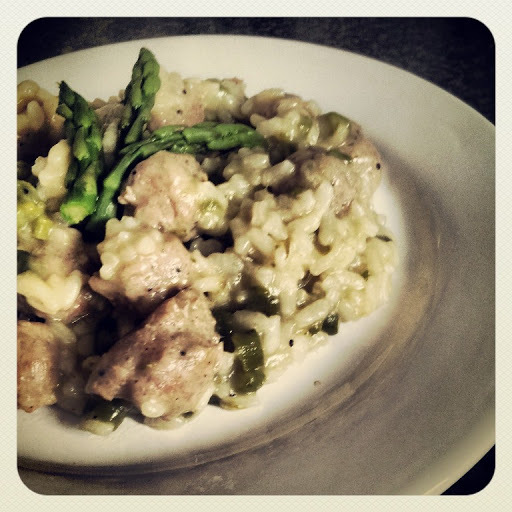 Until my original post a couple of months ago, I’d never really thought of pairing sausage and asparagus together before but the more I considered making a creamy sausage dish, the more it just made sense! So with the addition of some onion, mushroom, stock and risotto rice I soon had a new and exciting midweek meal. To balance out the creaminess of this dish add to give it a bit more personality I find a good helping of pepper really helps, so don’t be afraid to give the pepper mill a good twist or two…or three…or four. You get the picture. So, if you ever find yourself left with the odd pack of sausages and bunch of asparagus give this a go. If they’re not two ingredients you often find in your fridge then this is something you definitely have to try – head down to the supermarket now and treat yourself! Heat some olive oil in a large pan. Chop the sausages into bite size pieces then fry off in the pan until they begin to brown. Next add the onion diced quite finely. Cook until the onions are translucent and the sausages are cooked through. Slice the asparagus into pieces roughly an inch long and add to the pan with the sliced mushrooms. Let these cook for a few minutes. Next pour the rice straight into the pan and stir. Allow the rice to soak up the oil and sausage juices. When the rice has begun to go translucent add a ladle of stock to the pan. Let this simmer until almost all of the stock has been absorbed. Repeat this process until all of the stock has been absorbed into the rice. Season with a generous helping of the cracked black pepper. 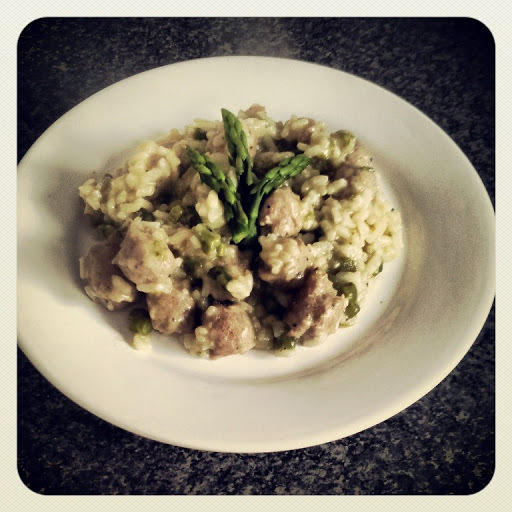 Allow to cook for a further 5 mins until the risotto is creamy and serve! 6 Weeks of Christmas Linky!